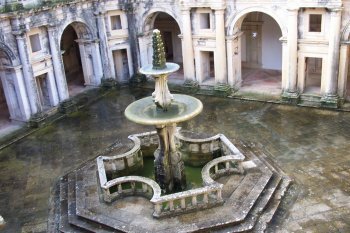 The Convent of Christ in Tomar is a combination of a castle and a convent, used by the Knights Templar. In 1160 the building of the castle was started. 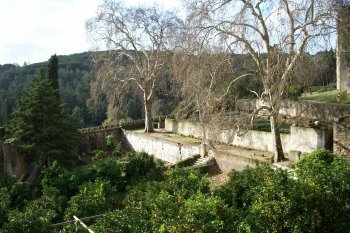 The land (like many more around Southern Europe) was given by the Portuguese king to the Order of the Knights Templar, in return for their support against the Moors. The convent was added later, as an extension to the castle. The Templar Order was dissolved in 1312 but their property in Portugal was transferred to the Order of Christ which was created in 1319. This new military order would undertake an important role in Portuguese overseas expansion in the 15th and 16th centuries. This I found a sight to go really out of your way for. You have to anyway, because it's quite a long drive from the major motorway between Lisbon and Porto. On the outside the complex looks like a massive, fortress-like castle. When you go inside (through a tiny and well-hidden door) the richnesses of the convent come to you. 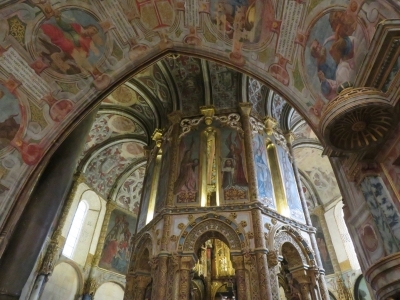 The major attraction inside, in the church, is the charola, a Romanesque rotunda full of frescoes and gold. My last monastery in Portugal, therefore its inevitably the least interesting. That's not to say that it was not a worthwhile site to visit. Nor is this convent lacking its own special charm. On the drive from Coimbra to Lagos, we arrived at the Convent of Christ in Tomar as it opened. Weather was overcast and the exterior of the convent is stark and uninviting. For me this convent felt evocative of those monasterial complexes found in the UK, lying in ruin. In this case, the "ruin" part of the convent was in fact, left unfinished. The Charola is the highlight, its splendor (arguably) unmatched in all other medieval interiors in Portugal. It really is stunning to walk into this space, I was not prepared for it. As I left this monastery, I felt fully satisfied. I had completed the "monastery" circuit in central Portugal and while I did not wish to visit another particularly soon, I was never bored. Nor did I regret a single moment in these beautiful testaments to medieval Portuguese life. Initially I was skeptical whether it would be a good idea to visit three monasteries on two consecutive days. Or whether it would be rather an overkill of sacral architecture. But it turned out to be an enjoyable and instructive experience to visit them one after another and directly compare the different styles: the rather plain and sober Alcobaça, the flamboyant Batalha, and the fortress-like Tomar. The three monasteries could not be more different, hardly possible to say which one was my favourite. The Convento de Cristo was built by the Knights Templar in the 12th century as a combination of a monastery and a fortress. In the following centuries, the convent was extended and redesigned, today it consists of buildings dating from the Medieval Period to the 18th century. You enter the convent through the abundantly decorated south portal, a first example of the Gothic-Manueline style. The centre of the monastery complex is the original round church of the Templars, the Charola. Later, the Charola was extended by a nave and a choir. But do not expect a huge church as in Alcobaça or Batalha, it is a small building compared to the size of the whole convent and the octagon with its beautiful murals is one of the highlights of the visit. Another one is the west façade of the church with the famous Manueline window. You should take your time to study all the details, the maritime references are clearly visible: ropes and sailor’s knots, coral motifs etc. No doubt that the Portuguese kings gained their wealth from seafaring. Apart from these highlights it is really enjoyable to explore the labyrinth of cloister stretching over three floors (I read that there are eight cloisters, well, I did not count them). You always have to take care not to miss a door or a turn to yet unseen parts of the complex. Other remarkable parts are the Great Cloister with four spiral staircases to the top floor and the dormitory, which is not one huge room, but two long corridors with monk cells. I stayed one night in Tomar. It is a pretty small town, on Sunday evening it was very lively in the streets around the main square, at the Roman Bridge and in the Parque do Mouchão (an island in the river Nabão). 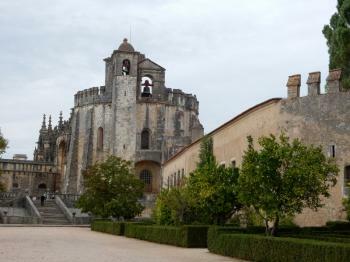 The Convento de Cristo is located on the top of a hill above the old town of Tomar. But from the town centre you can only see the walls of the medieval fortress. From the Ermida de Nossa Senhora da Piedade you have a beautiful view to the monastery (photo): left the remains of the medieval fortifications, the whitewashed wall of the convent and the church in the middle. The viewpoint is not far from the town centre, but you have to climb 300 steps. I took it as a morning exercise, but you can also go there by car. 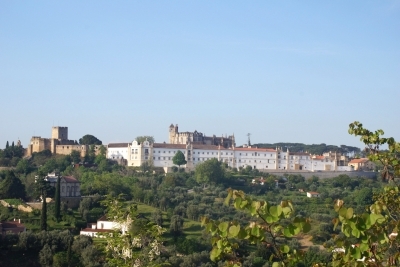 All in all, the Convento de Cristo is one of the finest WHS in Portugal and Tomar a nice place to stay for one night. You can spend many pleasant hours wandering around this huge complex, a mixture of a castle and a monastery. It was founded in the 12th century by the Knights Templar, and then extended and enlarged throughout the following centuries, even after the Order of the Knights Templar was officially dissolved (which didn't really happen in Portugal, anyway; they just changed their name into Order of Christ). Today it's a great mixture of Gothic, Baroque and Manueline elements, with 8 cloisters and the fantastic octagonal church, built after the example of the Church of the Holy Sepulchre in Jerusalem. Tomar itself is a pretty town with a direct train connection to Lisbon. The walk from the station to the convent takes about 20 minutes, and only the very last part is uphill. It's a great site that you should take some time to explore. I visited Tomar for the first time in February and found the Convent of Christ absolutely breathtaking - you need at least half a day, and if you are on your own you can easily spend the whole day there with your camera. Read more from Candy Blackham here. I visited this amazing place in winter so there were no crowds and it was misty, which added to the atmosphere. I would have loved to have had more information as I walked around. I loved the fact that everywhere was accessible and it felt really authentic, unlike many other places I have visited (in the world), which have been over restored and over-run with cheap souvenirs. This place is VAST with so much to see. I loved the different architectural styles each stunning in their own way. I guess if I had to chose between having lots of information and a smarter presentation or keeping the site as it is I would chose the latter as that is what I really love about it. It feels REAL. My advice: read up about it before you visit and then you will really enjoy it as much as I did. A fabulous place. I visited this WHS in August 2014. It's only 137km away from Lisbon and very close to another the monasteries of Batalha and Alcobaca. Nonetheless I decided to spend a night here to be able to visit late in the afternoon and early in the morning without the crowds. From the town centre, the Convent of Tomar is visible and it looks more like a castle or fort than a convent. Even when you arrive near the entrance and pass through the fortified walls, you wouldn't think it's a convent. Inside though it's a different story. There are several courtyards and cloisters, a dormitory, a refectory, a kitchen and a set of spiralling staircases that are quite similar to the ones in the Chambord Castle, France. The exterior is exquisitely carved in the Manueline (Portuguese Baroque) style with numerous gargoyles and Templar crosses. 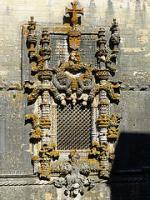 The highlight of the exterior is definitely the Manueline window (picture) while the highlight of the interior is the recently restored charola. This is one of the most beautiful and unique monastries/convents I have visited and I would suggest you allow at least 3-4 hours to visit. It's true that the exterior needs to be cleaned up from lichens and moss but at the same time I felt it was more authentic this way when compared to the whitewashed/cleaned up cloisters in other WHS around Portugal so at the end I was undecided. Either way I'd recommend a visit to anyone! I visited the Convent of Christ in July 2013 with my mother. It was difficult to find due to road construction meaning you need to approach from a back road. The size of the site is not clear from the approach Inside you just seem to find more and more of the complex as you walk around and go up and down stairs. The site is like a rose with more and more layers of petals that show something new with each layer. 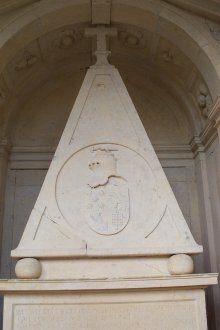 While the Templar part and history is fascinating, I found the complete history of the site surprising. The walk along the wall and the enclosed garden space was a joy to walk around in on a hot afternoon. Worth the drive off the main highway. 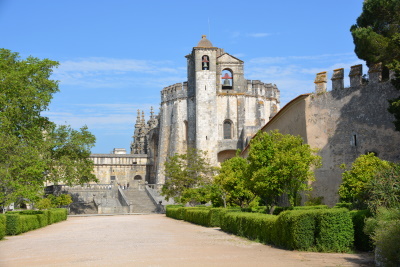 The Convent of Christ in Tomar was the headquarters and most important building of the Order od Christ, the same order that played a very important roll in the portuguese discoveries. It is a fascinating place that even today hides a lot of secrets in it's walls. A truly special place. Far more mystical and religious in impact than (somewhat) nearby Fatima, which is overrun by Marian Kitsch. Tomar is enormous, and completely open--no ropes keeping you away from exploring at your leisure. The Convento his prayer-soaked walls, and and unbelievable architetural richness, including an impressive Renaissance cloister. Definitely NOT over-run by tourism, and more than well worth the effort of getting there. I would return to Portugal for this site alone! One of the most intriguing and unforgettable places we've ever been in Europe. So calm and charming, but almost impossible to explain WHY. Perhabs in there we still feel that right way of living and faith. By the way there's very tasty oranges at the garden beneath the cafe terrace. At least we gathered about 10 kilos. Imagine - in March!! Sorry if it was criminal!! in the yard or exploring more and more rooms and spaces inside! Don't forget bottle of Portwine with you!! In town try most popular restaurant not far from the Cathedral, just down the street on the left, oder just half of portions, otherwise, you're dead. What a beautiful, calm and unexpected building-and wonderfully cool on a very hot day. We loved the fact that we were the only English speakers there-and that there were so few of us visiting-and that we were able to explore so freely;it added to the whole experience. We printed off guides to the building beforehand and found those available at the site perfectly adequate. The staff were friendly and, despite our mutual language problem, helpful. It's worth staying overnight in Tomar, which itself is picturesque, to allow you to follow the Templar 'trail' and see Portugal's only mediaeval synagogue. Overall, we felt the visit to the convento and Tomar well worth travelling slightly off the beaten track for. Fantastic! Full of mistery (if you like Templars and their history) but written description miss in a lot of rooms and places (particular in the last part of the visit) and the famous manuelino style window is covered with lichens! I think it's not a good situation for a UNESCO's world Heritage. July 2002 - So very very hot and the swifts and swallows screaming and swooping through the courtyards. The guide books were expensive or limited in their content and an english spoken guide would have added to our enjoyment of the trip. A clear explanation of the rope carvings around the windows would also have helped. Amongst the cloisters - a cool haven from the heat - at the heart of the building a strange representation of Jesus the Christ - sitting on a chair, looking mighty fed up and just like the rest of us on a bad day! Is that the spear mark in his side? What did the carver of the statue mean? The clear crisp blue sky and the smell from the formal gardens was superb. The charola was the same as many other Templar round churches or copies (e.g. Northampton UK) but nontheless spectacular. I would have loved to be told who stood on the column plinths around that special space...but the sense of calm that I felt meant that it didn't matter! Please keep the place safe. Prince Henry the Navigator: In 1420 he was made lifetime head of the Order of Christ which was the successor in Portugal to the Knights Templar after it had been abolished in 1312. It had made Tomar its HQ in 1357. Access to its enormous wealth gave Henry the funds he needed to sponsor Portuguese exploration. He also initiated further building within the Convent.